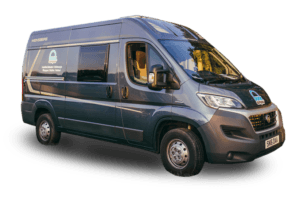 Here are the answers to the most frequently asked questions that we get asked about motorhome hire or campervan hire in the UK & Ireland. 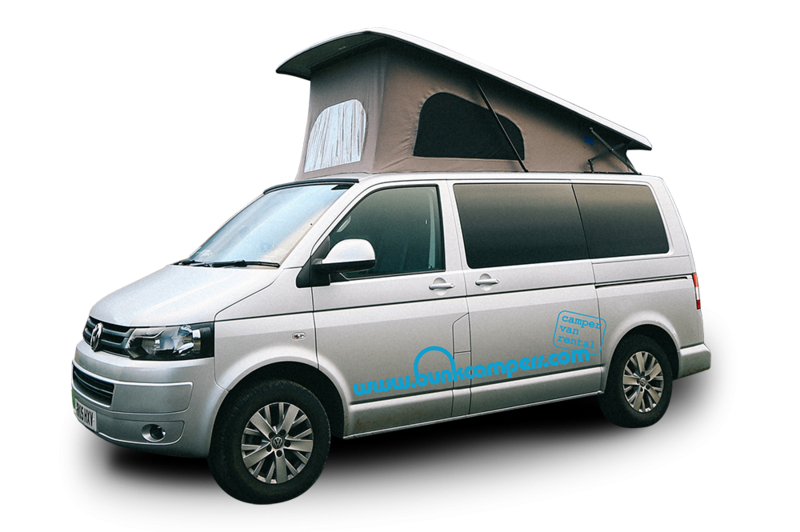 Please email us directly with any other campervan hire questions at [email protected]. The purpose of this page is to answer frequently asked questions that we receive from customers. For full Bunk Campers Terms & Conditions, please click here. How do I book a Bunk Camper? You can price your campervan hire, book and pay for your campervan securely on our website. 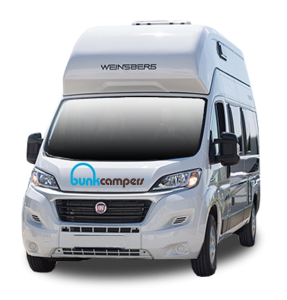 What is included in Bunk Campers daily rental rate? * excluding any insurance loading, extra charges may be incurred if the driver to be insured has a traffic conviction, holds a driving licence from a non-EU country or is in an occupation which is deemed high risk. These charges will be passed onto the customer. 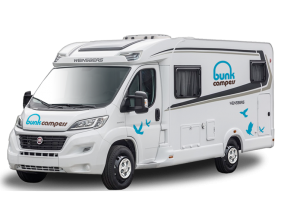 ** Bunk Campers supply full breakdown cover for any mechanical faults to the base chassis of the vehicle. Any call out charges necessitated by the client through operator error, e.g. a flat vehicle battery etc will be the responsibility of the client. 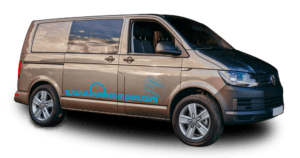 Online payment is the easiest and most convenient way to book and pay for your campervan or motorhome rental from Bunk Campers. 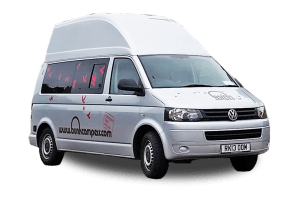 The benefit of booking and paying for your campervan online is that you know immediately that your campervan or motorhome is available and booked for you. We take full payment at the time of booking. 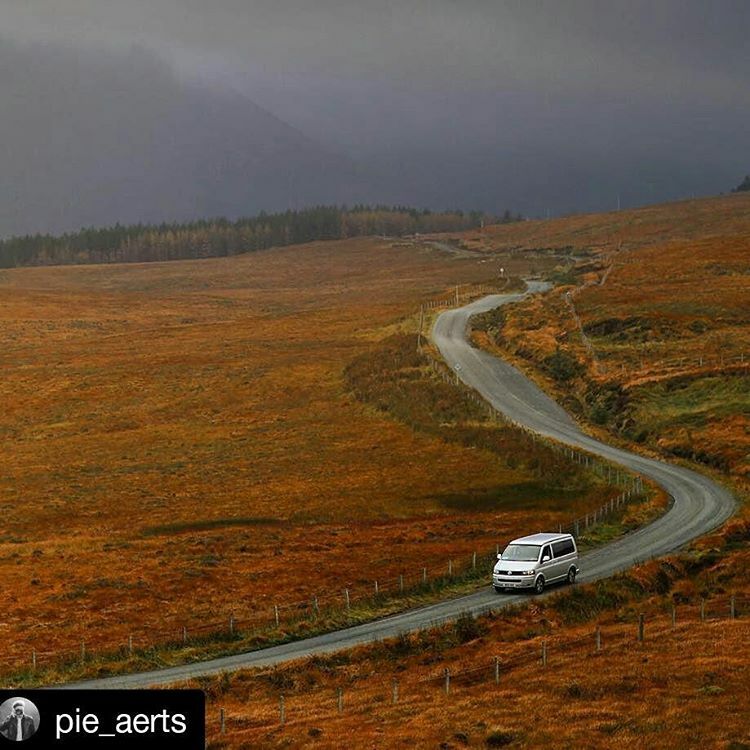 Our secure payment system ensures that you can pay for your campervan rental online with convenience and peace of mind. Check that your credit card limit/balance covers the cost of the booking otherwise your online booking will fail. You can also pay over the phone using your credit or debit card, using the same secure payment system used by our website. If you would like to pay by WorldPay, then we can send you a payment link to pay through. What if I have penalty points on my licence? It is still possible to hire a campervan from Bunk Campers if you have penalty points on your licence. You must declare at the time of booking if there are any endorsements on your driving licence. Bunk Campers may not be able to provide cover for you to drive the vehicle if you have certain endorsements imposed on your driving licence. Failure to declare any accidents or driving convictions invalidates insurance. We are unable to offer driver insurance if driver has had their driving licence endorsed or suspended or more than 6 penalty points imposed. There is a small daily charge for all penalty points. I am under 25 years old. Can I hire your campervans? The Roadie campervan is available for drivers aged 21-24 who have held a full driving licence for at least 2 years. If you are a young driver and do not hold a full driving licence, please contact us at [email protected] with your driver details and requested dates before trying to make a booking. The security deposit for young drivers in the Roadie is £1500. Do you supply a list of campsites in the UK and Ireland? Yes, we supply a campsite guide for the UK and Ireland. What is the price of fuel? You can find out about the price of fuel in Ireland online. What are the laws about where you can camp? Legally, you are not allowed to camp on the side of the road in Ireland, Northern Ireland, England or Wales. Wild/free camping is legal in Scotland. We provide a booklet of campsites where people can park overnight and also provide access to Safe Nights Ireland. For a small fee of around €10, local businesses, farms, restaurants etc provide safe overnight parking on their property for campervans and motorhomes. You can read more about free/wild camping here. What is your gas policy? Is there a discount code for the Stena Line ferry bookings? To avail of the 10% discount on Stena Line ferry crossings please call our office on +44 (0) 2890 813057 and a member of staff can help make your booking. Please check your destination and ferry times before calling. All vehicles have a minimum rental period of 7 nights in high season (April-October). In low season these campervans will have a 3 night minimum hire period. MiFi is a portable Wi-Fi device offering internet service while you are on holiday. You can connect up to 5 devices including smart phones, tablets and laptops. It comes preloaded with 250MB of data and you can top it up as you require more. Data lasts depending on usage. Roaming charges (data) charges may apply. How long does the gas last? How long the gas will last depends on the usage. Gas will be used to power the air heater in some of the campervans, the fridge while you’re wild camping, the hob and the shower & hot water in the Aero, Vista, AeroPlus, VistaPlus, Europa and Grande. Are there electric sockets in the campervan? Yes, but you must be using an electric hook up cable in order for the electric sockets to work. What do I need when I collect the campervan? At collection of the campervan all drivers must have a valid driving license and a second form of official photo ID (passport, national ID card, electoral ID card) and credit or debit card in their name to hold the security deposit against. Bunk Campers reserve the right to cancel a rental without these.. If you have a UK driving licence, we are required to check the counter part of your driving licence which is stored on the DVLA website. To do this, please bring your national insurance number, driving licence number and postcode to the depot for check in. This will ensure we can check the counterpart of your driving licence. UK driving licence holders can also log in to the DVLA website in advance (https://www.gov.uk/view-driving-licence) and receive a check code which will allow us to view your counterpart. Simply bring the code with you for check in and we will do the rest. Please note, this is a one-time check code so please don’t try to test it to see if it worked! Alternatively, you can access the DVLA website yourself and print the counterpart of your driving licence within 48 hours of check in and present it at the depot. We are unable to insure you to drive any of our vehicles if we are not able to check your counterpart driving licence details. All paper licences issued before 1998 are still valid. If you have a Northern Ireland driving licence, we require both the photo card of your driving licence and the paper counterpart. What is the maximum age to hire a Bunk Camper? The maximum age to hire a Bunk Camper is 74 years, 364 days. We are unable to hire to drivers aged 75 and above. For drivers aged 70-74 there is a mature driver insurance surcharge of £20 per night. Do I have to return the campervan with full fuel? Yes, customer’s should receive the camper with full fuel and it is your responsibility to return the camper with the same level of fuel as when you collected it. Credit card and debit card charges are non refundable. Administration fee of £45 / €50 will be charged. We advise you purchase travel insurance to cover any costs lost due to cancellation. All bookings are paid for in GBP (£). If you are hiring from our Dublin depot and would like to purchase hireable extras, these can be paid for in Euro (€) at the equivalent rate. What is the minimum age to rent a Bunk Camper campervan? The minimum age to hire a Roadie 2 person campervan is 21 years with a full driving licence held for at least 2 years. There is a young driver surcharge of £20 per night. 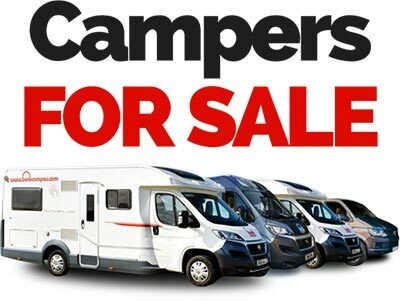 The minimum age to hire the Nomad, Ranger, Aero, Vista, VistaPlus, Europa and Grande campervans is 25 years with a full driving licence held for at least 2 years. Third party liability for personal injury. Third party liability for material damage. Personal accident. Insurance is not included. All hirers should arrange additional travel insurance suitable to their particular requirements. Please see our terms and conditions for information on full insurance coverage. Can I reduce my insurance excess? Yes. You can reduce the insurance excess by 50% or 75% for any damage caused in a collision to either the campervan or third party property. Special cover is also available for windscreen, mirror and tyre damage. What equipment is supplied for the camper van? Glasses/tumblers, mugs, cooking pots, frying pan, kettle, chopping board, cutlery including tin opener, bottle opener and kitchen utensils. Roadie, Nomad & Ranger – dustpan & brush, water hose, electric hook up cable, gas cylinder, tank of water. Aero, Vista, VistaPlus, Europa & Grande – dustpan & brush, water hose, electric hook up cable, gas cylinder, tank of water, clients to purchase own toilet chemicals. What hireable extras are available? We do not rent bicycles, electric generators and portable heaters. Do your campervans have shower and toilet facilities? Our Aero, Aero Plus, Vista, VistaPlus, Europa and Grande have a shower and toilet. A portable toilet is offered as a hireable extra for the Roadie, Ranger & Nomad VW campervans. These models do not have shower facilities. Do you have any automatic vehicles? No, all our vehicles are manual transmission. Where are Bunk Campers depots located? 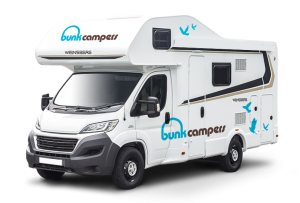 Bunk Campers depots are located close to Dublin International, Belfast City, Edinburgh International, Glasgow International and London Gatwick airports. How do I get collected from the airport? See website for current charges. If you book an airport transfer with us, our customer service team can arrange the details of this with you prior to your arrival. Please make sure that we have your flight arrival/departure information so that we know when to expect you. You will be given the relevant airport collection telephone number so you can give us a call once you have collected your luggage and are at the collection point. We also require your mobile telephone number so we can contact you if needs be! Once you have received your driver details, we will send you the address of our depots and the details for collection including contact numbers. We offer transfers from London Gatwick Airport and free transfers from Horsham Train Station to our depot. There is a direct train service from Gatwick Airport to Horsham Central leaving up to 4 times an hour and the journey takes around 15 minutes. A full list of our depots and where they are can found on our website here. What are Bunk Campers office opening hours? Our office is open for general enquiries and administration Monday – Friday 9am – 5pm. Our head office is based in Belfast, Northern Ireland. What are Bunk Campers depot opening hours? Our Belfast, Dublin, Edinburgh & London depots are open 9-11am and 3-5pm, 7 days a week. If you need to pick up or return your campervan outside of these hours, an out of hours service is available and costs £50 GBP. Late collection is between 5-7.30pm / Early drop off is between 7.30-11am. If you require an early collection from 7.30am-3pm or a later drop off from 11am-7.30pm this is by request only and charged at an additional night’s rental. Sunday collections and returns are available at our Belfast, Dublin, Edinburgh and London depots. These operate between 3-5pm (collections) and 9-11am (returns) and are charged at £50 GBP. What happens if I return the campervan late? The latest time to return the campervan is 11am. The charge for late returns is one day’s rental regardless of the circumstances! If you have confirmed an out of hours return time the latest return time is 7.30pm. Can I collect my campervan outside of depot opening hours? Normal depot opening hours for collections are 3-5pm. Out of hours collections are available – An early and late collection service is available if arranged prior to arrival. Late collection from 5-7.30pm / Early drop off from 7.30-9am is charged at £50 (each time). Earlier collection from 7.30am-3pm / Later drop off from 11am-7.30am is charged at an extra night’s rental (each time). How long does it take for the collection and return process? On arrival, allow at least 1 hour to complete the documentation, collection of deposit and demonstration of vehicle. On return, allow at least 1 hour for us to check the campervan and complete the documentation once you have returned to our depot. 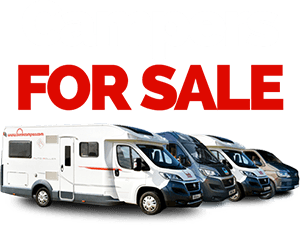 All rentals must take place at a Bunk Campers depot to allow us to carry out the essential checks, paperwork and demonstration of the campervans. How will I know how to use the campervan? Don’t worry, lots of our campervan hire customers are first timers! We are not! 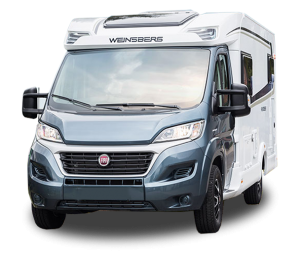 Regardless of your campervan or motorhome knowledge, we complete a comprehensive check in and safety demonstration of all features of the campervan. We will show you how to use the camping gas, heating, electricity and of course how to empty the toilet! When you are ready we hand over the keys. All our vans have customer manuals in them which will cover all the systems and information given at check in. Can the campervans be driven in Europe? Travel in Europe is permissible. There is no additional charge for European cover, however you must notify Bunk Campers at the time of booking of your intent to travel to Europe. A European travel pack is mandatory and you will be in breach of our terms and conditions should you take a motorhome into Europe without purchasing this. Up-to-date pricing for this pack can be seen at time of booking. The European Travel Pack includes the necessary documentation to take a hire vehicle into Mainland Europe and must be booked with all driver details presented no less than 2 weeks prior to the arranged collection date. Failure to provide this information in advance will lead to you being unable to travel to Europe. EU travel packs are not required for travel to Ireland! Do I have emergency cover when I am on the road? Yes. You have 24 hour Breakdown Cover provided under the hire contract. What average mileage does a Bunk Camper do? We get asked about fuel consumption regularly! The good news is that all our vehicles form a modern fleet with the latest most fuel efficient engines. How long does the battery system last in the campervan? 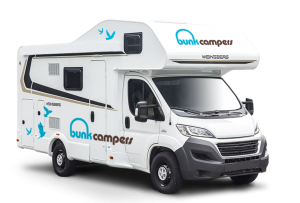 Bunk Campers vehicles have three batteries – one to run the engine and twin leisure batteries to operate the living equipment such as the fridge and interior lights. This battery will remain charged for approximately 8 to 10 hours. When you drive the campervan, you will recharge the battery. If the battery goes flat you can switch on the engine to start it again. You will need to plug the vehicle into 240V mains power for the battery to fully recharge. Can I do a one way rental? Yes, one way rentals are available across all of our depots. There is a minimum of 7 nights hire. Please contact [email protected] for rental conditions and charges. We offer relocation deals throughout the year. This will be a short one way rental from 1 depot to another and can be between any depots, for varying amounts of time. Please see our website for any current relocation deals. What do Bunk Campers charge for motorway toll fees? You are responsible for paying toll fees as you go. This excludes the Dublin M50 toll fee (Ireland) and the Dartford crossing on the M25 (England) which are automatically charged to Bunk Campers and payable by the hirer to Bunk Campers on return of the campervan. We have a limited number of pet friendly vans available at our depots on a request only basis. Please contact us directly with your requests. Smoking is strictly prohibited in all Bunk Campers vehicles. Can you fit child seats in your campervans? ALL of our campervans fit child seats and have a minimum of 3 forward facing seats (including the drivers seat). Child seats can be hired for the duration of your rental. Please note Bunk Campers staff are not responsible for fitting child seats. Can surfboards be carried on the roof of the campervans? Our larger campervans are big enough to fit short and long boards inside the vehicle. Please ensure you have a cover for your boards to protect the interior of the campervan. Please email us with any specific requests. For being a smaller van the Ranger has had 14″ surfboards in the roof before! Do you hire bike racks for the campervans? Bike racks are available on certain models. Enquire within for more information on bike racks. Please request a bike rack prior to your arrival. The cost of hiring a bike rack is £35. What campsite information is provided? What are the campsites near Dublin? What are the campsites near Belfast? Dundonald Leisure Park, 111 Old Dundonald Road, 0044 2890 809100.
www.theicebowl.com. You can email for reservations. What other information is available to help plan my trip? Check out our Trip Ideas to help plan your trip. For more current information and inspiration on the latest events across the UK & Ireland, visit our Bunk Blog. On arrival, using our local knowledge we can help all customers with an outline itinerary and recommendations. Visit Scotland, Ireland.com, Discover Northern Ireland, Visit England & Visit Britain also have a lot of useful information. What is the best time of year to visit the UK or Ireland? The main season is March to November. The season kicks off with St Patrick’s Day celebrations across Ireland. July and August are the busiest months for visiting the UK and Ireland. We think the best weather is in May, June and September! September through to March is a great time to experience outdoor activities in Ireland such as surfing, walking and cycling. The surf is best across the winter months. We advise that some campsites shut late September to mid October through to March. Some campsites stay open all year. Research the campsites along your planned route for the facilities you require for your trip. Alternatives to campsites are Aires De Service areas. The UK and Ireland offer a developing network of Aires de Service stopping places specifically designed for motor homes which include basic water and waste facilities. In Ireland, we provide Safe Nights Ireland membership which is a cheaper alternative to staying in campsites. The Safe Nights Ireland initiative provides safe overnight parking throughout Ireland for €10 per night.